Pretty awesome, huh? I just found this mentioned on another site. 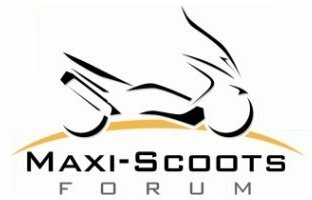 I like this sportier, leggier scooter concept. Hope to see more. I guess this is in the same category as the T-Max and the Kymco 300. Tall wheels, bigger engines. I just hope they hold down the seat height and the vehicle weight. And, of course, the price. To be honest, the looks don't do much for me. For some reason it just looks kind of out of proportion to me, especially from the side. It's the old Nexus with a different badge on it. Any word on when either the Gileria Nexus or this new Aprilia SR Max would come to the US? Gets back to the "Europeans get the cool stuff, not us." thing. Not bad looking... not sure I like the steering column look. I like the black/red coloring. Thought it might be a Nexus. Great looking bike but I don't see how they categorize it as grand touring. The steering column does look funky. What am I missing? What's so odd about the steering column? I guess that's to promote a straight-up seating position suitable for touring. Well, it's shown on the US site. Anyone have any idea of price? I like the looks of it. A bit small in the CC department for my tastes. But I'd give it a test ride.